"Faust's music as presented here searches into the unfathomable realms of what moves us, and...in this release has struck the proverbial chord, and the result is both joyful and celebratory." Fanfare. July 2007 review of CELEBRATION: THE HORN MUSIC OF RANDALL FAUST. Recordings of the music of Randall Faust are available on various labels including MSR Classics, Summit Records, Crystal Records, Albany Records, and ACA Digital Recordings. His compositions are regularly heard in concerts and recitals at universities and festivals around the country and have been performed at Symposia of The International Trumpet Guild, The International Horn Society, The International Trombone Association, and The National Association of College Wind and Percussion Instructors and significant venues such as the Bicentennial Festival of American Music at the National Gallery of Art in Washington, D.C., and the Weill Recital Hall of Carnegie Hall. During the past two decades his compositions have been discussed in several doctoral dissertations at major universities. His catalog of works includes his Concerto for Horn and Wind Ensemble, the Symphony for Band (premiered at the Alabama All-State Band Convention), the Concerto for Brass Quintet, Percussion, and Strings (written for the National Gallery Orchestra of the National Gallery of Art, Washington DC), and University Scenes for Wind Ensemble (composed for the Centennial Convocation of Western Illinois University in 1999). 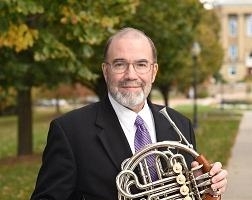 Randall Faust served as Professor of music at Western Illinois University from 1997 until May 2018--where his teaching areas included Applied Horn, Brass Chamber Music, and Music Theory and hornist of the Camerata Woodwind Quintet and the LaMoine Brass Quintet. Previously, he held appointments at Auburn University (Alabama) and Shenandoah Conservatory of Music (Virginia) where he taught a full range of music courses including Applied Horn, Composition, Music Theory, Electronic Music, and Brass Chamber Music. From 1985-2008, he was on the summer faculty at the Interlochen Center for the Arts. He holds degrees from the University of Iowa, Minnesota State University-Mankato, and Eastern Michigan University and studied at the Interlochen Arts Academy - Interlochen Honors Musicianship Project. Faust's composition teachers include Rolf Scheurer, Warren Benson, Anthony Iannaccone, Peter Tod Lewis, and Donald Jenni. He has been the recipient of the ASCAPlus Award from the American Society of Composers, Authors, and Publishers every year since 1990. Detailed information on the compositions of Randall Faust may be found at www.faustmusic.com. His current work entails maintaining a private studio, traveling the country presenting master classes and recitals, and working on a wide variety of commissions and composition projects.